For many multiparticulate products, the process begins with an inert core. As the starting material, the characteristics of an inert core influence each successive step including the end-product performance. Identifying the critical to quality attributes (CQA) of an inert core and how they influence a product is essential throughout the development, scale-up, and manufacturing stages. In this chapter, various characteristics such as surface area, particle size distribution, various density, shape, surface morphology, robustness and processability, hardness and tensile strength, and friability are discussed. These tests are beyond the pharmacopeial tests of standard and purity and usually do not appear on most of the inert core excipient manufacturers’ certificate of analysis. Understanding these characteristics helps in developing a robust product and also understands any unforeseen variability between different and the same batch of final multiparticulate dosage form. Werner D. Sugar spheres: a versatile excipient for oral pellet medications with modified release kinetics. Pharm Technol Eur. 2006;18(4):35. http://www.pharmtech.com/sugar-spheres-versatile-excipient-oral-pellet-medications-modified-release-kinetics. Accessed 18 Aug 2015. 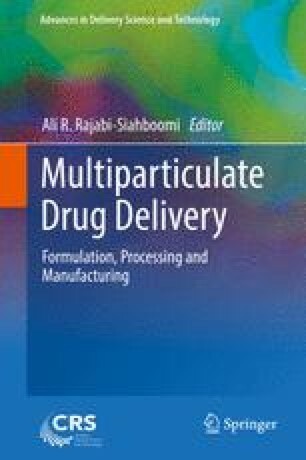 Sheehan C. Understanding the role of excipient functional category & performance-related tests in a quality-by-design framework, drug dev & del, September online issue. 2012. http://www.drug-dev.com/Main/Back-Issues/Understanding-the-Role-of-Excipient-Functional-Cat-340.aspx. Accessed 18 Aug 2015. Colorcon Product Information Brochure. Suglets. 2013. http://www.colorcon.com/literature/marketing/ex/Suglets%C2%AE/136612%20Colorcon%20Suglets%20PIB%20Proof2.pdf. Accessed 18 Aug 2015. ISO 13322-1:2004 static image analysis. Colorcon Technical Bulletin. Suglets. 2013. http://www.colorcon.com/literature/marketing/ex/Suglets%C2%AE/Tech%20Bulletin_Suglets_More%20than%20Monograph.pdf. Accessed 18 Aug 2015. Webb P. Volume and density determinations for particle technologists, Micromeritics Instrument Corporation:1–16. 2001. http://www.micromeritics.com/Repository/Files/Volume_and_Density_determinations_for_Particle_Technologists_0.pdf. Accessed 18 Aug 2015.